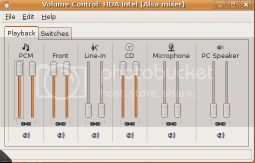 Ussualy effect intel HDA sound cards…Sound comes out both fronts and headphones at same time! My Solution for Ubuntu8.04………….Basicaly you just want to add a switch to the volume controll! Look for the subtitle “Module snd-hda-intel”. channel” you may have to choose another option or experiment. When the new window opens, cut and paste the new line you have just made at the bottom of all the text, save and exit. Restart and hopefully if you have not buggered up with the spacing as I did you should now have a SWITCH option in your “Volume Contol” found in the desktop panel. Just deselect or select to switch between speakers of headphones as it should have been from the start.